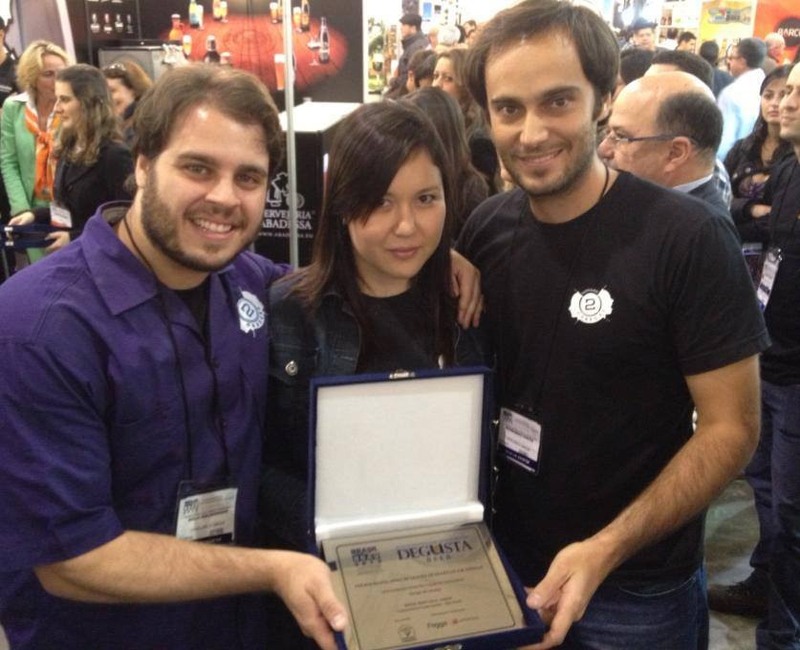 2cabeças with their award for Best Beer Label, which they won at Brasil Brau in June 2013. Today I am really excited to be able to bring you an interview with Maíra Kimura who is part of the Rio-based Brazilian microbrewery 2cabeças (2cabeças translates as 2 heads). I met Maíra quite randomly back in March at Lollapalooza when she was amongst a group of my sister-in-law’s friends who were waiting to watch Pearl Jam. Somehow the conversation turned to beer and I discovered that Maíra not only homebrews beer but also works for 2cabeças. A few months later Maíra was in São Paulo for Brasil Brau, a beer fair showcasing new technologies and, most importantly, Brazilian microbrews. Maíra very kindly invited us along and provided some very generous servings of 2cabeças beers. Since then we’ve kept in touch and now Maíra has very kindly agreed to answer some questions on behalf of 2cabeças. And so, without further ado, here’s what she had to say (2cabeças social media links / contact details can be found at the bottom of the interview). 1) Hey Maíra! Firstly, thanks for taking the time to answer some questions for the book is on the table. Secondly, Let me just say that I love the 2cabeças beers, particularly the Maracujipa IPA (I am very much a hophead) – something that is in no way influenced by your very generous free servings at Brasil Brau! Anyway, let’s start by getting to know a little bit about yourself. How did you get into beer and brewing? Since I have been old enough to drink, beer is my favourite drink. Back then we didn’t have a lot of options in Brazil so I used to drink the omnipresent mass-produced lagers and eventually some imported beers. In 2009, my husband’s company transferred him to Paris, and I, who worked in marketing for a large telecommunications company in Rio de Janeiro, resigned to go with him. As I had already done postgraduate in marketing, I decided to study something completely different and decided to learn how to make beer. I went to study at Sunderland, at Brewlab, and there I realised that beer could be more than a hobby. When I returned to Brazil, I did some more courses in the area of technical production and tasting. Today I can’t imagine doing anything else. 2) And tell us a little bit about 2cabeças. How long has 2cabeças been brewing beer, how did it all start and how did you get involved? 2cabeças started formally in 2012, but Bernardo Couto and Salo Maldonado, founders of the company, were already homebrewers before that. 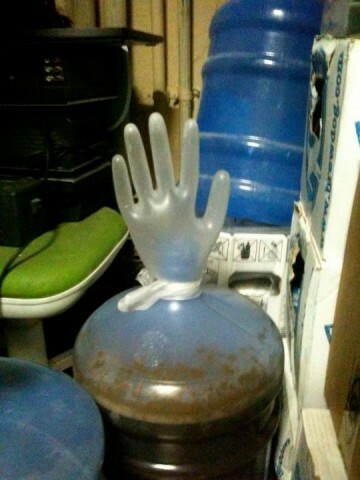 They made the first batch of Hi5 in 2011 and are always very amused when they describe how it was the first ever case of a beer naming itself: as they had forgotten to bring an airlock to put in the fermentation gallon, they tied a disposable glove on it. When the beer started to ferment, the glove began to fill with carbon dioxide and seemed to be asking for a high five – they then understood that this is just how the beer wanted itself to be named. With the success of this first batch among friends, they decided to produce a small batch to be sold, and sought partnership with a brewery already in operation in Rio de Janeiro. Thus they began operating in a contract brewing model, and since then they’ve worked with four different breweries and have developed other products such as Maracujipa and some other seasonal beers. In mid-2012, when I returned from Europe, I met the boys and as we chatted about beer and everything else, we began to realise that we had various goals and way of thinking in common, and they ended up inviting me to join the company. 3) How many beers does 2cabeças currently produce? And what are they? Most importantly where can we buy them from? Currently we produce Hi5 (6.2% ABV, 62 IBU) a Black IPA loaded with Simcoe, Maracujipa (7.5% ABV, 75 IBU), an IPA in which we add passion fruit, and Saison à Trois (5.8% ABV, 30 IBU) a saison produced in collaboration with Invicta brewery. On our Facebook page we maintain a map with points of sale that have our beers. 4) The Brazilian beer market is largely dominated by bland macrobrewed Pilsners like Brahma, Skol, Antarctica and Itaipava. However, it seems that over the past ten years microbrews have really started to become more prevalent and popular in Brazil. Why do you think this is? Do you think Brazilian tastes are slowly changing? Ten years ago the market for speciality beers in Brazil was small, very niche-oriented. There were a few brewers more concerned with quality, such as Colorado and Dado Bier for example, and some importers were bringing a few labels here. However, with the growth of the average income of the Brazilian, people began to travel more abroad and had contact with different products, and from the moment they experience something better, people start to become more demanding. Of course this is a slow process, but Brazilians gradually come to understand that beer is more than the corn juice that the big industry offers. Thus, new microbreweries began to emerge in the last decade, what fostered further growth of the public and market speciality beers in Brazil. 5) What are your favourite microbreweries in Brazil right now? And your favourite Brazilian beers? 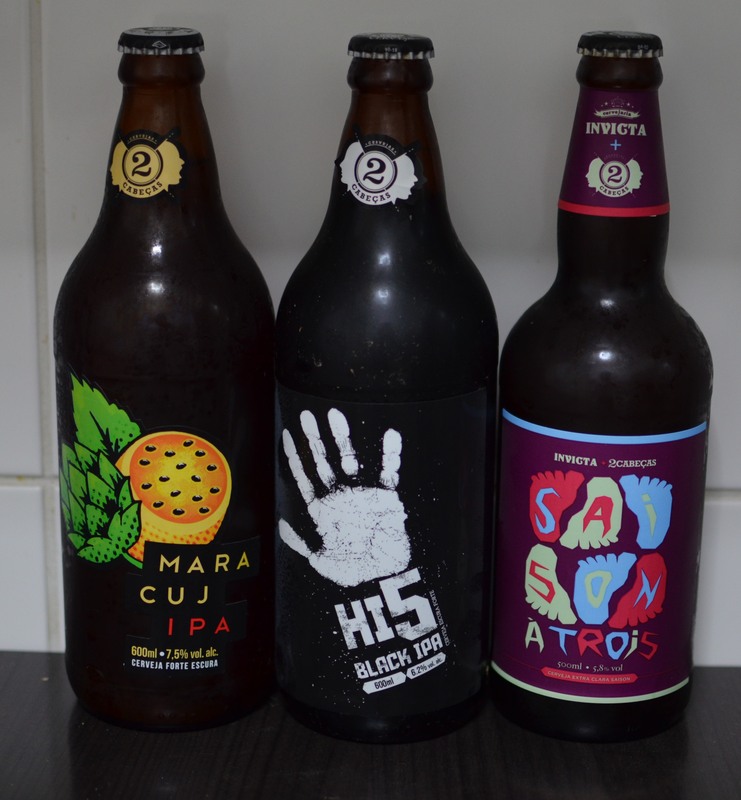 I admire innovation and brewers who are not afraid to experiment, and in this sense the breweries of Curitiba are a little further ahead than the rest of Brazil: three of my favourite ones, DUM, Morada and Bodebrown are there. Today, Hi5 is really my favorite (it was my favourite before I became co-owner of 2cabeças, I swear), but whenever I get the chance, I drink DUM Petroleum and Seasons Green Cow. Also recently tried the Invicta 1000 IBU and really liked it. 6) And worldwide, what are your favourite international beers? 7) One thing I’ve noticed is that many Brazilian microbreweries have strong German and European influences (not surprising I guess given the German heritage in the south of the country) which means that a lot of Brazilian microbrews tend to be imitations of those from Germany and Europe. Whilst there’s nothing wrong with that (and many of those beers are very good), what I really like about microbreweries like 2cabeças, Colorado and Amazon Beer is that you acknowledge those influences but at the same time add your own Brazilian touch (for example, using Brazilian fruits, etc). What influenced 2cabeças to do this with their beers? What influences and moves us is the desire to innovate, to create differentiated products. Thus, it is natural that we search elements that are familiar, elements of our culture and our cuisine to reinvent them using them in our recipes in a different way. The Maracujipa, for example, arouses much curiosity in foreign people, who consider passion fruit to be exotic. 8) What do you hope for the future with 2cabeças? Are you hoping to expand and maybe export your beers abroad? The idea is to create more and more products to increase our fixed line of beers and to brew seasonal beers. We actually have a lot of plans to do a lot of things, you’ll see! We do not have plans to export yet, but who knows? 9) Finally, what advice would you give someone (like me) who would like to brew beer and potentially start their own microbrewery in Brazil? Practice homebrewing and improve your techniques. Always keep in touch with people in the market. Form partnerships with more experienced players. The timing is good for new entrepreneurs to enter the market, so plan your strategy well, but most importantly, do not be afraid to dare! For more about 2cabeças and to find out where you can buy their beers check out their website and Facebook page, or follow them on Twitter (@2cabecas).